Turn up the heat with the Fire Storm Air Hockey Table from Valley-Dynamo! This exciting table hockey unit is packed with thrilling features, hot graphics and serious speed. 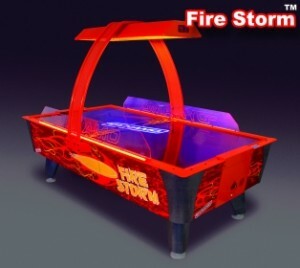 Backlit graphics, an overhead blacklight, and glowing UV-coated playing surface ensure some dazzling competitive play. The Dyna-Blast blower system provides added speed wile easy-adjust leg levelers and a sturdy cabinet offer stability and long-life. The LED overhead scoring display and optional side display help automatically keep score amidst the excitement of interactive flashing lights and new, engaging sounds. 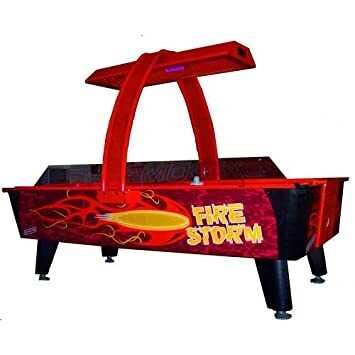 Keep the competition heated and your game room lively with the dynamic new home version of the Valley-Dynamo Fire Storm Air Hockey Table. New goal design puts speaker behind puck return and closer to the player.